I am thrilled to announce that my essay “Body and Soul: Copyright Law and Enforcement in the Age of the Electronic Book” has just won the 2012 Calibre Prize for a long-form essay on any non-fiction topic. The prize is administered by Australian Book Review and supported by the Cultural Fund of Copyright Agency Limited. I’m pretty sure this is the first time I’ve won anything since my epic undergraduate poem “The 1500 Words of Loretta DeFrupp” took out the Dr Seuss Tribute Competition organised by the Adelaide University Literary Society’s Timely Literary Suppository. Since then I’ve been lucky enough to be nominated, shortlisted and highly commended, I’ve been a finalist and a runner-up, but never outright won anything. I was overjoyed to hear that I’d been longlisted and then shortlisted for the Calibre prize, along with four intriguing essays by accomplished writers: Claire Corbett’s “The Last Space Waltz? : Reflections on 2001: A Space Odyssey and NASA—On Being Earthbound at the End of the Age of Atlantis”, Enid Ratnam-Keese’s “Mapping the Edges of the Night”, Bronwyn Lay’s “Imaginary Exile” and Colin Nettelbeck’s “Now They’ve Gone”. I had most of a blog post written in my head about how winning isn’t everything, a bronze or silver isn’t a loss, and how in my judging experience a shortlisting often means that someone is in there fighting hard for you. It was going to be called “You have won second prize in a beauty contest” and would probably have referenced the Simpsons episode where Lisa is outdone by Winona Ryder and dreams she’s in an almost-supergroup with Art Garfunkel, John Oates and Jim Messina, singing their #2 hit “Born to Runner-up”… But then they went and spoiled it all. Woo! The most precious manuscript held by the Royal Irish Academy is RIA MS 12 R 33, a sixth-century book of psalms known as an Cathach (‘the Battler’), or the Psalter of St Columba. It is believed to be the oldest extant Irish psalter, the earliest example of Irish writing – and the world’s oldest pirate copy. 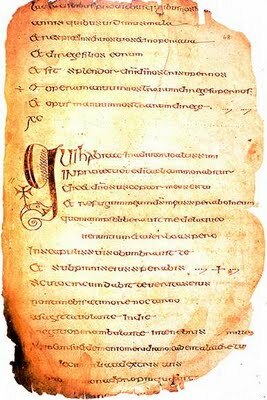 According to tradition, St Columba secretly transcribed the manuscript from a psalter belonging to his teacher, St Finian. Finian discovered the subterfuge, demanded the copy, and brought the dispute before Diarmait, the last pagan king of Ireland. The king decreed that ‘to every cow belongs her calf’, and so the copy of a book belonged to the owner of the original. Columba appealed the decision on the battlefield, and defeated Finian in a bloody clash at Cúl Dreimhne. No trace remains of Finian’s original manuscript, if it ever existed. Only ‘The Battler’ survives. Finian v Columba is difficult to reconcile with modern copyright law. The psalms in question were attributed to God, revealed to David, and translated by St Jerome in the fourth century, so Finian’s claim to copyright in the work is unclear. It may be that the pagan Diarmait simply free-associated his judgment from the calfskin of the Cathach’s pages. But any want of judicial rigour is surely redeemed by the king’s early intuition that there is something valuable about a book beyond its physical self, that it has spirit as well as flesh and a soul beyond its body – as well as by the delicious consequences of an actual military war being fought, at least in part, over a single illegal copy, and of that outlawed copy becoming a national treasure. You can read the whole thing in the September 2012 issue of Australian Book Review, in print or online. If you’re not a subscriber, you can read the essay and a tonne of other great stuff for $6. Thanks, ABR and CAL! Many congratulations Matt! You must be very excited. I am looking forward to reading it. suspicious though this may be, there’s no evcednie either way to explain how Dunne got his Longford position in 1957 (1.14.10, 1.14.157.2).It’s striking from the Ryan Report that on no occasion when any complaints were made about Dunne in his period after leaving the Brothers, did anyone ever think to contact the Brothers to establish whether Dunne had a history of such behaviour. The fact is that the Irish Church isn’t a single coherent body, so much a cluster of 184 linked parts, each with its own head, with woefully inadequate formal and informal channels of internal communication.It’s striking, on reading about Dunne in the Ryan Report, where he appears as a ‘Brother Brander’ that one boy he taught described in a statement to the Gardaed what Dunne seems to have got up to when was a brother (1.14.06-7),’I personally was never touched by Brother [Brander]. Back then … it was a common thing for Brother [Brander] to keep one of the boys back after class. […] I remember the talk about Brother [Brander] at that time was that he would come up behind the boy he’d keep back after school and touch him and ask the boy if he had any marbles.’I happen to think this is a very serious thing indeed, but it does make me suspect it was — at that early stage in Dunne’s career — more or less identical to the type of behaviour that David Norris, back in 2002, said was hardly serious at all:’In my opinion, the teacher or Christian Brother who puts his hand into a boy’s pocket during a history lesson, that is one end of the spectrum.’Have copies of correspondence between the Brothers and the relevant people in Longford emerged since the Ryan Report?